Assets in the Horizons Marijuana Life Sciences Index ETF - the first marijuana exchange-traded fund - surpassed the $1 billion mark on Monday for the first time since Oct. 18. Pot stocks have been climbing steadily since hitting a low around Christmas Eve, with the HMMJ fund up 56 per cent since the close on Dec. 24. While it was the first exchange-traded fund to track the cannabis industry, HMMJ is no longer the biggest. That honour belongs to the U.S.-based ETFMG Alternative Harvest ETF, which surpassed US$1 billion in assets this week for the first time. Sean Dollinger, the former chief executive of Namaste Technologies, says he remains committed to the company even after he was fired from his position on Monday. In a statement, Dollinger said he continues to be committed to the company as a director on Namaste’s board and as its largest shareholder. Dollinger was dismissed from the Toronto-based cannabis e-commerce company after it identified alleged breaches of fiduciary duty and self-dealing related to the sale of its U.S. division, Dollinger Enterprises US Inc., in 2017. Namaste is also launching legal action against Dollinger for damages and disgorgement. California-based Amyris said Tuesday it is looking to use fermentation technology to convert sugarcane syrup into the active ingredients found in marijuana. Amyris’ initial focus is to make cannabidiol - or CBD - the molecule used to treat medical conditions such as anxiety and sleeplessness. The company adds it is also targeting multiple CBD molecules that have medical and therapeutic uses without being psychoactive. This is the third company looking to ferment cannabinoids following Ginkgo Bioworks, which has a partnership with Cronos Group, and Hyasynth Biologicals, of which Organigram Holdings is an investor. 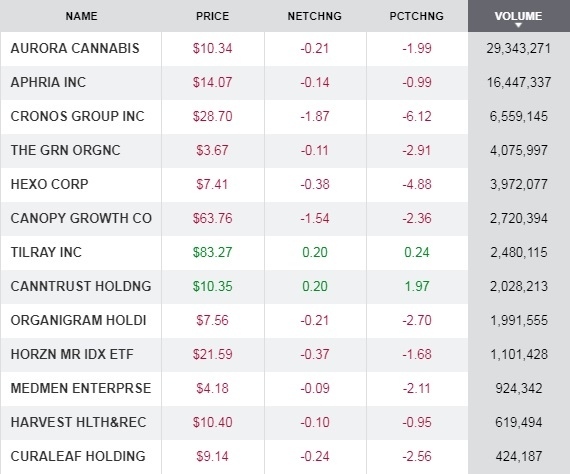 – How much Aphria shares have advanced during a four-day winning streak that started last Wednesday.